One of the best ways to be consistent when it comes to healthy eating is to take a few minutes to make a plan. Without a plan, you’ll likely get frustrated, overwhelmed, and fall back on convenience foods that may not offer much nourishment. I know you know this already, and I know not everyone is a planner-aheader. As a matter of fact, I’m not always good at planning ahead either. But if I can at least plan a little bit. If I can at least have some ideas in mind of healthy foods I can make from the ingredients I have on hand. If I can at least have a few healthy foods prepared and in the freezer. Well, it sure does save my brain, my budget, and my having to resort to not-so-healthy foods in a pinch. Get into the habit of taking time to plan. Sure enough, it does take time to make a meal plan. It takes effort to sit down and get myself organized when it comes to what we’ll be eating each day. 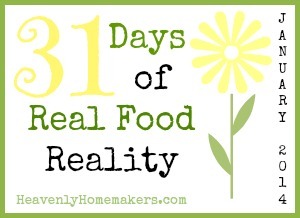 There is no magic formula or magic wand to wave to put real food on the table without effort. But the time I save later after having spent time planning our meals for the week? Wow is it worth it! Don’t make it difficult. Simply pick a main dish and a vegetable/fruit or two for sides. Don’t feel locked into your plan. Use it as a guide and be flexible. I switch our planned menu around all week long based on what sounds good each day. But since I’ve got a plan, I know I’ve got the food, so I can roll with it! Always try to keep basic staple ingredients on hand. Here’s a list of ingredients I try to always have available. If I have basics on hand, there’s no end to what I can make at a moment’s notice! At the very least, I believe it’s a good idea to keep a package of pasta and a jar of sauce on hand at all time to fall back on. Always have frozen vegetables in your freezer. That way, no matter what main dish you end up serving, you’ve got a vegetable in the freezer to pull out and steam to go with your meal. Take advantage of resources available to help. What do you do in an effort to plan ahead for healthy eating? This post was sponsored by Plan to Eat. I can’t say enough good about all they offer! I find that our schedules can change a lot during the week, so I like to make a list of meals sometimes rather than a plan of what we eat each day. That way I have guidance for shopping and I know I have all of the ingredients on hand for whatever works out. Ever thought about Panko crusted cauliflower. A little olive oil, Parmesan cheese, seasonings, whatever you choose, my daughter likes hers spicy, Panko, mix and bake 450 until golden, about 20 min. Yummy. 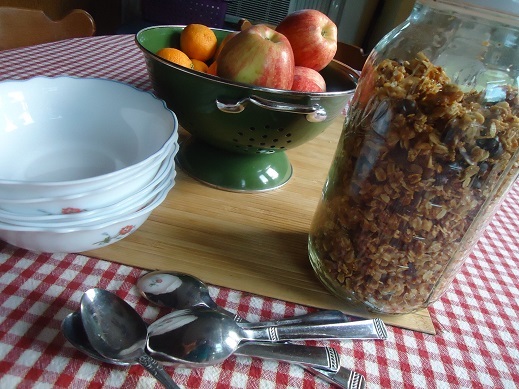 Thanks for your wonderful tips and recipes , I’m going to make the granola this weekend. Hubby & I both work outside the home and baby is still on bottle food so I don’t plan breakfasts or lunches, but I do buy enough options (eggs, oatmeal, etc.) Work lunches are leftovers or a salad from the grocery near our workplaces. For dinner, I made a template for each week that lists Beef, Poultry, Pork, Meatless, Other, and Sunday Dinner. I have lines for the main entree, the starch, veggie 1 and veggie 2. This gives us variety, ensures we eat at least 1 meatless meal, & leaves a night for eating out or eating leftovers. “Other” can be seafood if we find a healthy one at a good price or it can be a freezer or pantry meal made on the fly. “Sunday Dinner” is because we like to make a more time consuming or special dinner for Sundays. The template is not so restrictive that we MUST have beef on Monday, Poultry onTuesay, etc. I also have a box on the bottom for “Snacks” so we have healthier options on hand. And I have another box for “Desserts” so I have ingredients to whip up healthier dessert options instead of storebought cookies or cake. I find that buying in bulk and buying all my meat, dairy, spices, frozen veggies etc. at the beginning of the month make it easy to pull any meal together. If I stay stocked on all the basics, many different meals can be made. This has made cooking for our family so much easier. I find that listing my recipes seasonally helps me plan ahead. That way I can cook food according to what produce/meat is locally in season/butchered. For instance I make pork chops with rhubarb chutney in the spring and switch to pork chops with apples and shallots in the fall. Things often catagorized as vegetables start with asparagus in the spring, followed by peas, spinach, green beans, tomatoes, cucumbers, corn on the cob (technically a starch), zucchini, green peppers, broccoli, leeks and squash (scallions, onions, shallots, garlic and potatoes are available throughout the summer and fall), so meals are planned accordingly. The same goes for dessert. Barring holidays, we only eat dessert on the weekends so many recipes get made only once a year. I start with rhubarb in the spring, then strawberries, raspberries, peaches, sour cherries, zucchini, apples pumpkin and last of all cranberries. Winter allows for chocolate desserts and recipes using frozen fruit. Plus, I buy cuts of meat from local farmers based on what I think we will eat, 3 beef roasts for the winter, 1 package of breakfast sausage a month, etc. Planning seasonally, ensures that I make all my favorite recipes at least once a year. It also makes time consuming recipes less daunting. I love French onion soup with salad, and creme brûlée for dessert, but it takes a while to make (especially with 3 kids underfoot). Knowing I only have to make it once a year, makes it doable. Plus, I can repeat my favorite recipes like roasted asparagus with parmasean every week, since asparagus season is so short. I might eat some produce frozen like green beans, but things like asparagus or large tomatoes are best eaten fresh from the farmer’s market.